At GIW Industries Inc., we’re firm believers in the adage “There’s no such thing as a silly question” — especially when it comes to pumps and pumping systems. In fact, it’s often a customer’s inquisitiveness that pushes us to find solutions to industrywide issues. In our last newsletter, we counted down “Our Top 10 Questions of All Time” in celebration of 10 years of The Flowsheet. In this issue, we’re turning it over to you, our valued customer! Do you have a great question for GIW Industries Inc.? If so, we want to hear it. We’ve been listening to — and learning from — our customers’ questions for over 100 years. This attentiveness and dedication to our customers’ success is what sets us apart from other pump providers. It’s also what keeps us in business. We work hand in hand with our customers to help them run their pumps and set up their entire pumping systems for maximum efficiency. We prioritize resources like our world-renowned slurry course, in-house R&D team, the KSB blog, and this newsletter not only so you have the support you need but also so we can continue to find new solutions to everyone’s slurry pumping problems. All it takes is one great question to set the wheels in motion. With this in mind, we hope you’ll keep sending in your questions. We want to keep working hard to find the answers you need! 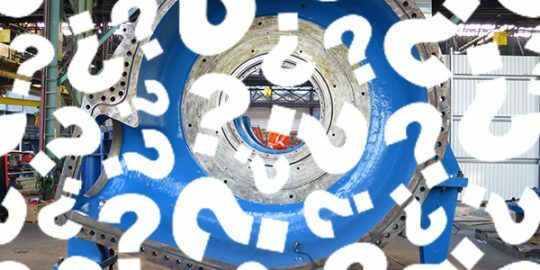 If you’ve been struggling with any aspect of your slurry pump or piping system — big or small — then please get in touch. You can send your questions to us directly by clicking here. Your question may even be featured in a future issue of The Flowsheet! Thanks for keeping us on our toes. Together, we’ll continue to make the slurry pumping world an even safer and more productive place.